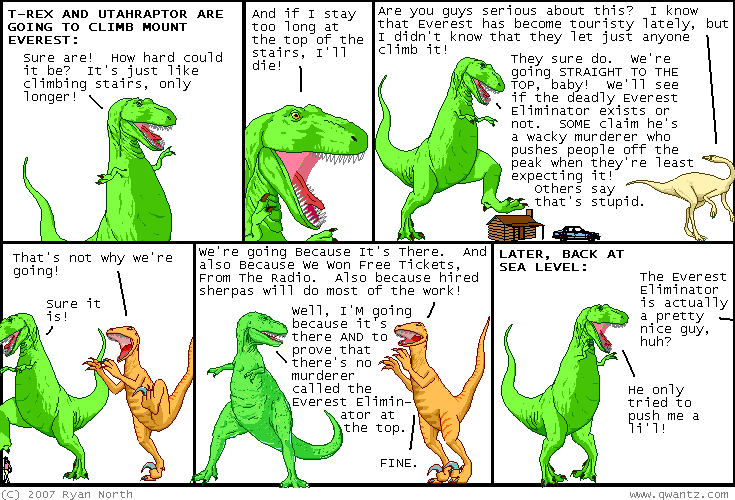 Dinosaur Comics - February 6th, 2007 - awesome fun times! –Anyway, Kay wished that every decision she made would be the right one! February 6th, 2007: I realized I never thanked the awesome dude who sent me a postcard recently from very far away! It came all the way from ANTARCTICA. It's incredible that I have mail from that continent! It really feels like getting mail from the moon: a place so far away, and that I'd kind of like to visit someday, but that I always considered was too expensive AND improbable. The picture shows ice and penguins! Thanks man!